According to the Coldwell Banker Home Listing Report, the average listing price of a four-bedroom, two-bathroom home in Connecticut is $423,117. Check out listings in Connecticut and the full state ranking for 2014 below. 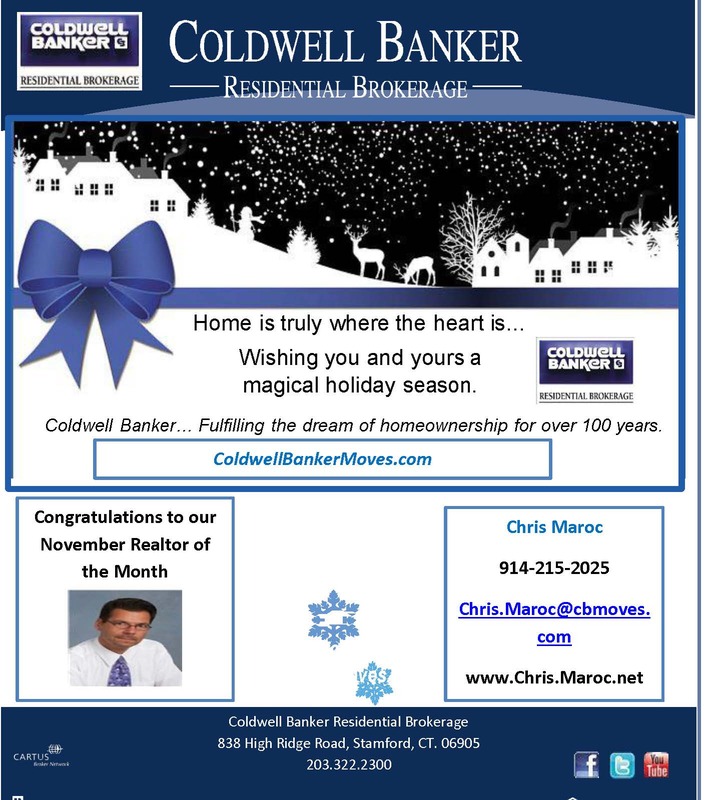 To see how your market compares nationally, visit hlr.coldwellbanker.com. Some tips for mastering the season of Yuletide gratuities. Does the service at your building seem a little more top-shelf lately? Most likely, that’s because Thanksgiving Weekend marks the kickoff of holiday tipping season. No. You’ll be in the minority, but tipping the staff at the holidays is a custom, not a requirement. Plenty of staff tell us they treat non-tippers the same as tippers—just as plenty of others admit to extending fewer favors (or making them pay-as-you-go) and fewer smiles to non-tippers. Q. How much should I tip building staff? The precise amount of each tip depends on the size of your building (the larger the staff, the smaller the individual tips), quality of service, staff seniority, length of time you’ve lived there, whether you own or rent (see below), personal chemistry, your financial circumstances, and whether you’re frugal, generous or somewhere in between. Here’s a general framework—adjust accordingly. Q. How much should I tip total? Owners in doorman buildings: Twenty-five percent of Scrooges owners in doorman buildings reported tipping nothing at all, with the bulk (38 percent) reporting tips totaling between $250 and $1,000. On the high-roller end, 21 percent tipped in the $1,000 to $2,500 range, while just 4 percent said they anted up more than $2,500. Owners in non-doorman buildings: Like owners in doorman buildings, about a quarter said they tipped nothing at all. More than half tipped up to $250, with only about 20 percent handing over more than $250. Renters in doorman buildings: In some ways, renters in doorman buildings were more generous than owners last year: Just 4 percent (compared to a quarter of owners) said they planned to tip nothing at all. About 25 percent of renters in doorman buildings tipped up to $250, another quarter tipped in the $250 to $500 range, and another quarter in the $500 to $1,000 range. About 20 percent tipped more than $1,000. Q. My building’s ‘doormen’ are actually security guards who don’t do much besides sit there. How much should I tip them? While some security guards do just sit there, others work just as hard as doormen. In the former case, it’s okay to tip on the light side. Q. One of my doormen is a jerk, and I never see my super. Do I have to tip them? In BrickUnderground’s Naughty vs. Nice Holiday Tipping Poll two years ago, 65 percent of nearly 600 voters with “bad” doormen said they still planned to tip them, usually in the range of $25 to $50 apiece. As for those with delinquent supers, only 49 percent of the 455 respondents planned to give them some extra cash, clustering in the lower part of the $25 to $100 range. Q. Should I tip the new doorman the same as the one who’s been here 20 years? Q. Is it okay to tip my favorite doorman more than the rest? Q. Should the amount I tip correspond to the rent I pay, or how many people live in my apartment? Tipping is (theoretically) about rewarding service, not about how big your apartment is or how much you pay for it. If you’re a family of five—or someone who works from home and receives a lot of deliveries or visitors–you probably receive a lot more service from the staff than a 25-year-old software developer who lives alone. Q. I’ve had a financial setback and can’t afford as much as last year. What should I do? Staff is accustomed to senior citizens on fixed incomes tipping lightly, and they are usually “forgiven,” though some workers say they won’t perform extra services for these residents gratis. As for lost jobs, divorce, etc., many doormen tell us that if they receive a small amount—particularly from someone who normally tips just fine—they automatically attribute it to financial trouble and that there is no need to say “wish I could do more.” Of course, this won’t fly if you’re still taking your annual jaunt to St. Bart’s and waltzing in with Bergdorf’s bags. And if you frequently ask for favors, the “unable to make ends meet” card may eventually run its course. Q. My building has a tipping pool. Do I need to give individual tips on top of that? Q. Why do renters usually tip lower than owners? Landlords: Some renters believe that holiday bonuses are the landlord’s responsibility, whereas in a co-op or condo, residents are their own landlord. Disposable income: There are far more renters at the early stages of their careers—and earning power—than owners. They simply have less money to spend on tips. Moreover, first-time renters who are also first-time New Yorkers may not be familiar with the custom of holiday tipping. Property values: With so much invested in the building, owners have a bigger stake in how the building is cared for. Q. Should I tip my landlord or management company? What? Isn’t the rent enough?! No, seriously, there are actually situations where a gift, if not a cash tip, makes sense. If you have a close rapport with your small, mom-and-pop landlord, a nice bottle of wine is not out of order. Similarly, if you are calling the management company every other day to see if a larger apartment has become available to accommodate your growing family, a little something to stay top of mind (and top of the wait list) certainly wouldn’t hurt. Q. How much should I tip non-building workers? Cleaning service: Tip 15 to 20 percent throughout the year, as a portion of their earnings goes to the cleaning service. If the same crew cleans your apartment each time, a holiday tip (one week) is appreciated. Full-time nanny: One week’s pay minimum, or two if you can afford it. Or, one week’s pay and one week’s vacation. UPS delivery: Since UPS assigns drivers to specific addresses, $25 to $50 if you have a lot of packages delivered. More if you have a lot of business-related deliveries. Mail carrier: By law, mail carriers can’t accept cash or anything worth more than $20. In reality, some (but by no means most) residents do tip in the $25 to $50 range, especially if they receive a lot of deliveries or a lot of mail that requires signatures. For a fuller discussion of the postal carrier tipping question, click here. FYI, you do not need to tip your property manager, contractor (plumber, electrician, etc. ), or real estate broker. Q. 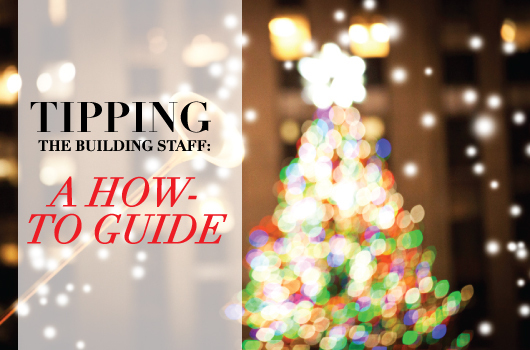 When is the best time to give a holiday tip? Q. Do I have to tip at the holidays if I tip all year round? Residents who tip year round for extra services often go on the lighter side at year’s end—at least with the staff who’ve been receiving those a la carte tips. Q. Do I have to tip for a full year if I just moved in? Q. Are checks okay or do I have to give cash? Can’t afford to tip in cash? All is not necessarily lost. Check out the BrickUnderground Guide to Alternative Tipping for some creative workarounds. Q. Should I include a card or a note? Q. Are food or gifts an acceptable substitute for cash? Q. How do I tip staff I rarely see? Q. Do staff tell each other how much they’re tipped? Some do, so to be on the safe side, assume yes. Also, be aware that many staff members keep lists comparing your tip this year to prior years. You should do the same. Q. Should I bump up tips each year to keep up with inflation? Q. Are tips tax deductible? If you run a business from home, you can claim a small deduction of up to $25 per staff member, categorized as a “business gift” on your tax return, says Manhattan accountant Koreen Jervis of Korje Tax Professionals. The percentage you can deduct must correspond to the amount of your apartment used as office space, however. That means that if your tax return states that 25 percent of your apartment is used for business, you will only be able to claim 25 percent of the $25 deduction, which works out to $6.25 per tippee.